As you may know, Christopher Booker has written a long paper for the GWPF on groupthink and how it relates to the global warming scare. It is a long read, but Dellers offers a potted version. But as Booker – via Janis – shows, there’s a much more simple explanation than conspiracy theory. It has to do with the bizarre, but very well documented tendency many humans have towards embracing fashionable nonsense. According to Janis there are three rules of groupthink. Rule One. A group of people come to share a common view or belief that in some way is not properly based on reality. Rule Two. Because their common view/belief cannot be subjected to external proof they have to reinforce its authority by claiming ‘consensus.’ The idea is to emphasize that all right-thinking people hold this view and that it is no longer open to challenge. Rule Three: Anyone who disputes this ‘consensus’ must be excluded from the discussion: at best marginalized; at worst openly attacked or discredited. These, Janis showed, were the rules which led to the Pearl Harbor/Korean War/Bay of Pigs/Vietnam War disasters above. They are also, as Booker shows, the rules which explain the current global warming hysteria. The scare originated in the imaginations of a tiny handful of people. Just three in fact. First of these was a Swedish meteorologist called Bert Bolin who had been obsessed, since the late 50s, with the idea that carbon dioxide, being a greenhouse gas, must inevitably precipitate potentially disastrous global warming. Next came Dr John Houghton, an evangelical Christian and former professor of atmospheric physics at Oxford, who became seized with the spirit of Bolin’s notion – and proceeded to proselytize on its behalf via his influential position as head of the UK Met Office. And the third of this unholy trinity was the hugely rich Canadian businessman and Marxist Maurice Strong who knew little about the environment but who quickly grasped that it was the perfect cause he could exploit to advance his left-wing global agenda. Without this trio’s passion, energy and influence, the entire global warming scare might never have happened. But between them they had the necessary skillset to push their pet issue onto the world stage and embed it in global political consciousness. This they did under the auspices of the United Nations, via a series of conferences – Geneva in 1979; Villach, Austria in 1985; and ultimately the Rio Earth summit in 1992 – which caused interest in global warming to snowball. In 1988, thanks to their efforts, the Intergovernmental Panel on Climate Change (IPCC) held its inaugural meeting. It was sold to the world as an impartial body of scientists but it was never any such thing. Right from the start it had a political purpose which trumped any scientific one: to assert the existence of man-made climate change and to urge dramatic, concerted action to stop it. Does all this so far sound like a denialist’s paranoid conspiracy theory? Of course it does. But that’s OK – thanks to Christopher Booker’s expert marshalling of the facts, we can fully back up these scandalous allegations. If you haven’t got the time to read Booker’s GWPF report then I’ll give you a choice selection in part 2 of this article. ← HuffPost Rely On Twitter Trolls For News Now! — and groupthink applies exactly to the “consensus” that free-trade and free-markets are essential. They are actually destructive and anti-democratic. Read John Grey “False Dawn”. Except that is obviously nonsensical. Trade and markets are individuals choosing to sell and buy. The exact and total opposite of a group, let alone Groupthink. And since the mountain of evidence, not just theory, shows that are responsible for lifting billions of people from poverty, it seems odd to say they do not. And since they are people freely exercising their free will to what they want, they are utterly democratic, and anything that prevents them doing that is antidemocratic. I really don’t know how anybody without a preconceived notion could think otherwise. A non sequitur is a statement, remark, or conclusion that does not follow naturally or logically from what has just been said. John Nicholas Gray (born 17 April 1948) is an English political philosopher with interests in analytic philosophy and the history of ideas. He retired in 2008 as School Professor of European Thought at the London School of Economics and Political Science. Gray contributes regularly to The Guardian, The Times Literary Supplement and the New Statesman, where he is the lead book reviewer. Gray has stated that he considers himself an atheist. PPE Exeter coll’ Oxford LSE – FFS. So, basically, John Nicholas Gray knows the square root of FA, please reference the first quote. Thank you Athalstan, you and Phoenix44, hiding behind your anonymous identities, are perfect examples of groupthink. You fit the three laws of groupthink in clear sequence exactly. 1.0 You adopt a view not based in reality. 2.0 In the absence of data you claim consensus. 3.0 You resort to abuse. Perfect – congratulations to Booker for his analysis. Always enjoy reading your comments mate. This one is, as usual, excellent. Free trade and free markets existed long before the perverse concept of socialism. And whilst mankind prospered under capitalism, it stalled in the 20th Century with some of the most murderous regimes ever known, operating under socialist regimes, and it’s ultimate conclusion, communism; hitler, mao, pol pot, stalin, castro etc. And no, I won’t grace their names with capitalisation. I think Groupthink explains the scientists, but by and large not the rest. Over the last few years we have an strange concentration of politicians with Messiah complexes – Gore, Blair. Obama and now Macron all suffer – and a rising tide of virtue over outcome amongst the young, the media and other politicians. The key scientists in the farrago such as Mann also have Messiah complexes, and really believe they were put here to save the Earth. Stir all that in with the Left’s desire to increase the power of the state and rein in capitalism for their own ends, and the radical Greens desire to send us back to some imagined Paradise, and you have a large group that can coalesce around a cause even thought they come at it from very different places. And where’s the advantage to anyone in standing against all this? Most voters “trust” scientists, the costs can be fudged and at the start looked a long way off, and who doesn’t want to make our air clean and the planet healthy? It doesn’t even explain the scientists’ behavior. As Janis defined it, groupthink involves a small closely knit group where individual decisions become influenced by the group ‘as a whole’. So as he used the concept it applied to small groups of decision makers who become largely separated from outside influence. Later work has shown that Janis’ groupthink account of episodes like the Bay of Pigs fiasco is questionable at best. So it’s not clear that the idea has any strong empirical support. At any rate, it becomes even more questionable when it’s extended it to widespread phenomena like the AGW hysteria. I’m afraid that groupthink is now mostly a catchphrase used by journalists and miscellaneous pundits in the public arena. 1992 and all that, UN agenda 21 was the main thrust, climate change policy was the vehicle to achieving the transference of funding from west to south and east. The climate change bollox is just a means to an end and in the meantime the corporate blob feast themselves on leeching off the taxpayers of the west, Deutsche bank, GS, Morgan Stanly, hedgers in green manipulation like Grantham and the rest indulge in finding, advocating and constructing less than useless speculation, doom mongering, shilling palliatives to solve a non existent problem and the lies just grew into absolute whoppers. “Saving the world” the penguins, penn state university, Noaa, the poley bears, rain, drought, cold, heat, runaway lies, piled on more – yes you’ve guessed it – MORE LIES!!! FFS, that vacuous, eternally nebulous sound bite and all jam tomorrow and saving the fruit bats……..and the dark continent thrown in………….. if. IF, “you just see you way to putting your hands in your pockets again”…….. what politician wouldn’t jump on that bandwagon? I would feel negligent in my responsibility to my fellow man not asking the questions we sceptics are asking. If an ignoramus like me, a former believer in the climate change scam, can ask a few simple questions (starting with how much CO2 is actually in our atmosphere) then others are ripe for conversion to scepticism. I also find it incredibly coincidental that when atmospheric CO2 dropped to around it’s lowest level in the planet’s history (at one point I believe down to 180ppm) humankind happened along and discovered how to make fire. Were I a religious man, I might consider it divine intervention, but I’m not. It fires me up and disgusts me in almost equal measure. Global warbling, what a scam it all is; its barefaced, blatant, and indeed the insouciant lying from the likes of bliar, camoron to maybot and everyone in between, broon, miliweed, huhne, davey, rudd and perry, most all in the Westminster claque, from crimson red left and red lite to pink and yellow. Groupthink works even better when your income depends on falling in with it. From Pablo Ocampo? (WSJ Comment, 1/21/10)? Ten Rules For Anthropogenic Global Warming Success…”After many centuries of failed attempts, alchemists have finally found the perfect combination of elements that can be turned into gold; CO2. Today’s alchemists are the Pharisees and Sadducees of anthropogenic global warming. Their entire theory, and it is an unproven theory, is based upon faith that their models, models which can of course be skewed any way they like, are correct. Napoleon Bonaparte himself would be duly impressed by their multi-pronged battle plans for dealing with climate change and those who question whether or to what extent it is anthropogenic in nature. Rule One: “The science is settled.” Repeat this at every forum imaginable and as often as possible until it is a mantra. Of course never forget to mention that “The world’s scientists are in consensus.” For the purposes of rule one, completely ignore the fact that over thirty thousand scientists, nine thousand of which have PhDs, have signed a petition specifically stating that the science is far from settled. Rule Two: Take control of and therefore “redefine” the peer review process: To this end, intimidate and/or replace editors who don’t toe the anthropogenic line with ecstatic frenzy. Once you have seized control of the editorial boards, prevent deniers from publishing. Since they will have few if any peer reviewed papers they will be safely sidelined. Rule Three: if rule two fails, blackball publications that allow articles which either state that the science is uncertain, or that there is no proof that man’s activities cause warming, or that anthropogenic warming exists but it will not result in the apocalypse. When in doubt, blurt out that their publications are funded by the coal industry. Rule Five: Guilt scientifically illiterate but often well-meaning politicians into forking over billions for pro-anthropogenic research. If they hesitate for even a moment, ask them why they don’t care about the planet. Inform them that even if the science is uncertain, which of course it isn’t, isn’t it better to be safe than sorry? Isn’t an ounce of prevention worth more than a pound of cure? Rule Six: When skeptics file Freedom of Information Act requests, stall as long as possible. If this fails, destroy the raw data. Above all, destroy all incriminating emails. Rule Eight: If malfeasance is discovered, state that it is just a few overly eager scientists whose ILLEGALLY obtained emails were taken out of context. And even if they have done something either illegal or unethical, so what. A few bad apples can’t cast doubt on the thousands of PEER-REVIEWED scientists who are responsible for the CONSENSUS. In any case, how could such masses of individuals possibly engage in a conspiracy of such proportions? Rule Nine: Create a whole new field of journalism called eco-journalism. These propagandists will be wholly dependent upon us for a constant stream of chicken-little attention-grabbing headlines. They will prove highly reliable for they can never forget which side their bread is buttered on. If anthropogenic global warming isn’t real, they would all be out of a job. Broadlands. Excellent post You nailed it. Please spread this around. Our situation with North Korea today is a direct result of Truman firing General Douglas MacArthur for wanting to finish North Korea off when we had the chance. The left always wants to stop short of victory–Vietnam, Iraq, you name it. The self-loathing left always want to punish the West. I’m sure it is the result of mental illness. With respect, while group think does indeed apply to “global climate something something manmade,” in general group think is not a recent discovery. In Plato’s Republic it seems at first it is difficult to think of any reason why people live in communities or co-operate. Socrates comes up with a strictly economic account: specialization and division of labour, or what has been called comparative advantage. Once “luxury” is introduced, there are long struggles to show how people can be trained or coerced into caring at least as much for the common good as for themselves. If people were strictly rational, this might be hopeless, but with the image of the cave we are told that people are familiar with adhering to a consensus–so much so that they resist thinking for themselves. The light of enlightenment literally blinds them and makes them uncomfortable. So with a few people shouting cliches, achieving conformity is easy. In the case of the boomers, in some order: they were badly brought up and poorly educated; they believe they are intellectually and morally superior to previous generations; they have a vague idea that “nature” has always been harmed by capitalism, or even by agriculture from its beginnings; they have lived through a series of exaggerated environmental scares which became increasingly “global” as opposed to local. One might think there is a new enlightenment, including a new degree of attachment to science, but the boomers have been easy prey for warmism or “climate change” alarmism. (One might even say peer-reviewed literature has become generally unreliable, rather than generally reliable; so much for professional ethics and things like that). There is a strange combination of arrogance and humility; everybody who can pick up some jargon thinks they know something about the climate of the whole world; and we must defer to experts, even if we can easily see that some of what they say makes no sense. It’s all a bit medieval. There was never a need to invoke conspiracy. The actions are not rare – look at the way a trade union evolves and operates. Essential, related reading for parallels is “The Apocalyptics” by Edith Efron, a clinical analysis of the USA false scare about man made chemicals causing a cancer epidemic from the 1980s. These scare events unhappily leave a legacy of new, restrictive, bureaucratic laws and regulations. Global warming is set for a lasting legacy of many of these, so concentrate now on sunsetting. Geoff. Sorry, but it was much simpler than all this: Roger Revell, Pres. of Scripps Institute wondered if the increased CO2 from WWII’s burning down everything could affect the pH of the seas. 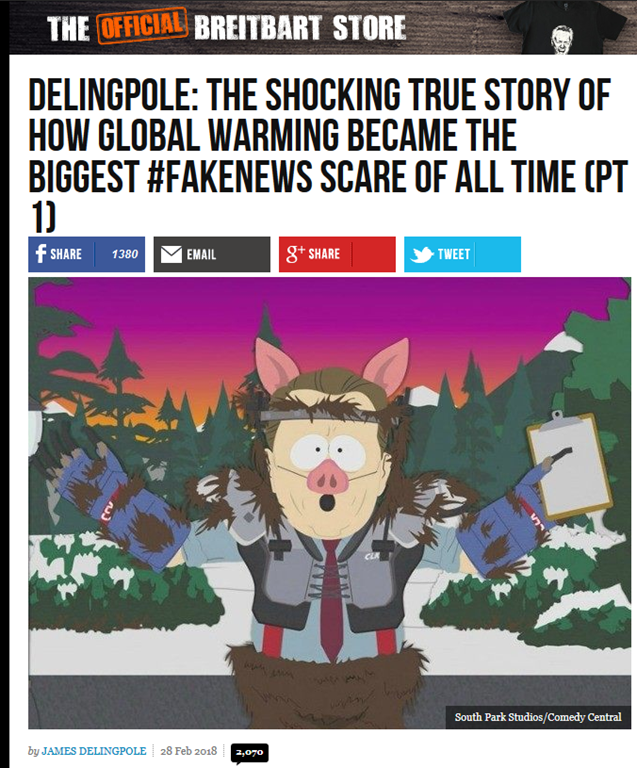 He was confident it did not, but in the piece he published speculated that it might be affecting the atmosphere and what of all the CO2 coming from internal combustion and should the energy companies be taxed! Bingo! The elected ruling class saw a path to money and power! I have a free piece, “CO2 Is Innocent at https://sciencefrauds.blogspot.com that proves CO2 does nothing in the atmosphere with a simple demo-experiment costing a few Dollars to do. Clip-copy it, print it and have a physical science teacher authenticate it, do the demo and know of what you speak. Truth is power. I would say that Callendar was a more important progenitor. But it was Keeling’s analysis of CO2 concentrations in the atmosphere that provided the major impetus. But even that was just one of the early stepping stones. I see this as more an episode of mass hysteria similar to the witch hunts and financial speculations. And the problem is that computers make people dumber and more susceptible to complete nonsense. People don’t think critically or even have that capability. Could CO2 really be more important than solar effects? If the model says so and seems to fit, they buy into it. Some warm winters helped spread this silliness. And if the data doesn’t fit their hypothesis, they change the data. To me, the groupthink main strategy is to state opinions as facts…..